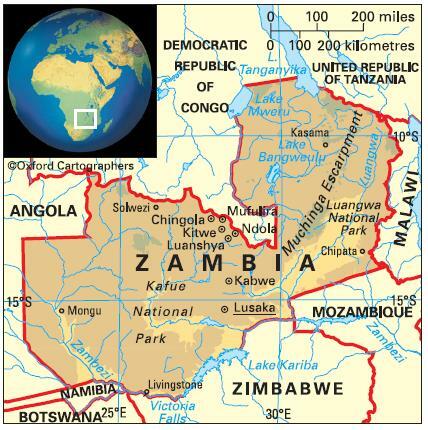 Zambia is a landlocked, fertile and mineral-rich country on the Southern African plateau. It is bordered by: (clockwise from the north) the United Republic of Tanzania, Malawi, Mozambique, Zimbabwe, Botswana, Namibia (via the Caprivi Strip), Angola and the Democratic Republic of Congo. The country comprises ten provinces (from south to north): Southern, Western, Lusaka, Central, Eastern, North-Western, Copperbelt, Northern, Muchinga (whose creation was announced in October 2011) and Luapula. Tropical, but seldom unpleasantly hot, except in the valleys. There are three seasons: a cool dry season April-August; a hot dry season August-November; and a wet season, which is even hotter, November-April. Frost occurs in some areas in the cool season. Rainfall is 508-1,270 mm p.a. The most significant environmental issues are deforestation, soil erosion and desertification; health risk posed by inadequate water treatment facilities; threats to big game populations by poaching; and air pollution and resulting acid rain in the areas surrounding mining and refining operations in Copperbelt Province. 14,075,000 (2012); 40 per cent of people live in urban areas and 11 per cent in urban agglomerations of more than a million people. The population growth rate stood at 2.6 per cent p.a. between the years of 1990 and 2012. In 2012 the birth rate was 43 per 1,000 people (49 in 1970) and life expectancy was 57 years. Life expectancy fell in the late 1980s, due to AIDS, but began to rise again in the early 2000s. There are 73 indigenous ethnic groups of Bantu origin. The largest, representing about 18 per cent of the population, is the Bemba of the north-east and Copperbelt. Others include the Tonga of Southern Province, the Nyanja of Eastern Province and Lusaka, and the Lozi of the west. There are small minorities of Europeans and Asians. Zambia is classified as a lower-middle-income economy by the World Bank.